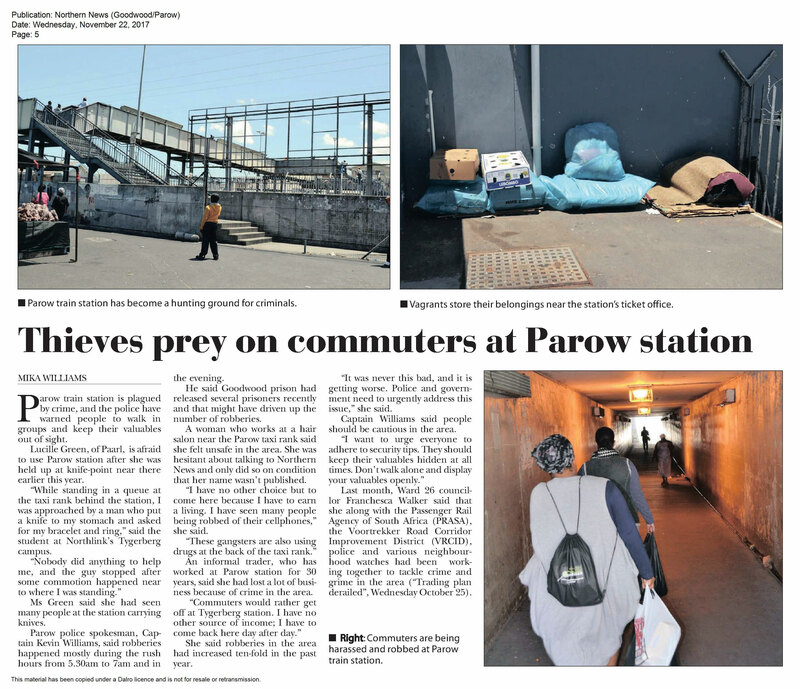 There is a CCTV camera installed opposite the Parow Station. These cameras are manned by the City of Cape Town. Are these being done in a pro-active manner? When something untoward is seen, are SAPS and VRCID staff alerted? Was the installation of these cameras an exercise in futility? This is what the Chief Operations Officer of the VRCID, together with the Ward Councillor and other roleplayers need to establish. I am one of the victims. Got robbed during day light and instead of people helping me they ran away. Parow has become one of the unsafe places in Cape Town and I feel that the police are not doing enough. have complained even to the councellor but the problem remains. collect my maid at the station once a week and it has become a paradise for sqatting etc. Parow is a dangerous Place my younger son attended North Link College Safety & Suciaty and was robbed twice in Station road. I think that Police are doing a good job but must be more visible at both Taxi ranks Parow station and Voortrekker road Parow, Shoprite and the Post office. I’ve in Boston and VRCID are petrolling even in the back roads.